Home » Football » Where Are All the Richard Sherman Autograph Cards? Where Are All the Richard Sherman Autograph Cards? ♫ Hello. Is it me you're looking for?♫ When Lionel Ritchie wrote those lyrics, he was thinking of love. 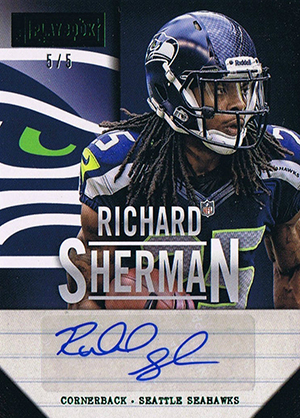 For collectors, you could sing the same song when it comes to Richard Sherman autograph cards. Actually, until recently, you could say that about any Richard Sherman cards. Despite being one of the NFL's top defenders and a big personality, Richard Sherman autographs have been slow to make their way to the market. And even as the number of different cards grow, most are extremely rare and tough to find. As a result, those that do surface are commanding higher amounts than one might expect from a cornerback. A lot higher. 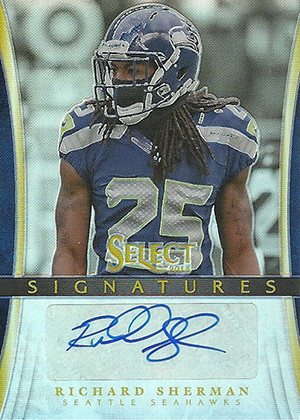 Shop for Richard Sherman autograph cards on eBay. Despite being a rookie in 2011, the first mainstream Richard Sherman cards didn't arrive until2012 Panini Contenders. Sherman is a rare breed in today's hobby where he only has one rookie card. And it's one that is a regular base card. There's no serial number and no autograph. 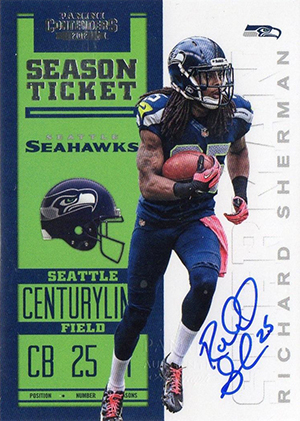 It wasn't until 2013, his third season, that the first Richard Sherman autograph cards arrived. Panini landed the cornerback for several of their 2013 products, yet most of the individual cards come with small print runs of 25 or less. 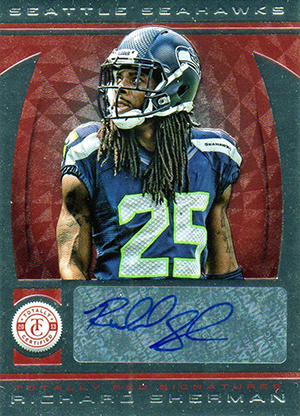 So far, the most plentiful Richard Sherman autograph cards are 2013 Select Signatures and 2013 Panini Totally Certified Red, both of which are numbered to 99. It's worth noting that 2013 Panini Contenders Football has a signed version of his 2012 Contenders rookie card that's not numbered and a print run hasn't been confirmed. Since October, when his first autograph cards released, prices of those sold on eBay have averaged more than $150. The more common cards are at the low end, selling in the $80 to $100 range. The top sale during this time was a 2013 Panini Playbook Green card numbered to 5 that closed at $510. It's safe to say that Richard Sherman autographs are bringing in big bids. But will it keep up? While Sherman is one of the NFL's best and a popular player on a team with a big local following, these prices are more about rarity. All it would take is a bigger deal with Panini or Topps and that rarity could disappear. Prices already seem to be dropping a little with each ensuing release he's a part of. But they're still going strong. Data based on completed eBay sales between October 12, 2013 and January 9, 2014. RICHARD SHERMAN score 2013 RED ZONE SP 30 !! Richard Sherman & Earl Thomas Prowlers Printing Plates & Cards. Rookies & Stars. 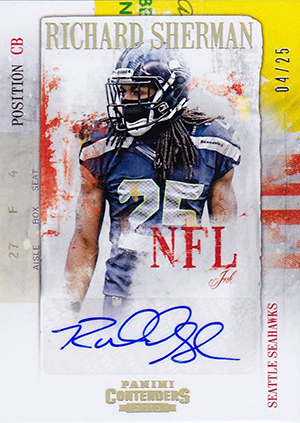 RICHARD SHERMAN score 2014 RED ZONE SSP 20 !!! Chrome rainbow down to gold but can’t even find a red. Let me know if anyone hears of a red /25 of his for sale @AutoSetsNBA on Twitter. I’ll pay a finder’s fee. I’ll let ya’ll know how my senior bowl auto grades out.